, a learned German, was born at Erlbrt, the capital of Thuringia, in 1536. The first academical lectures which he heard, were those of Luther and Melancthon, at Wittemberg; but the air of that country not agreeing with his constitution, he was obliged to return to Erfort, where he studied Greek. 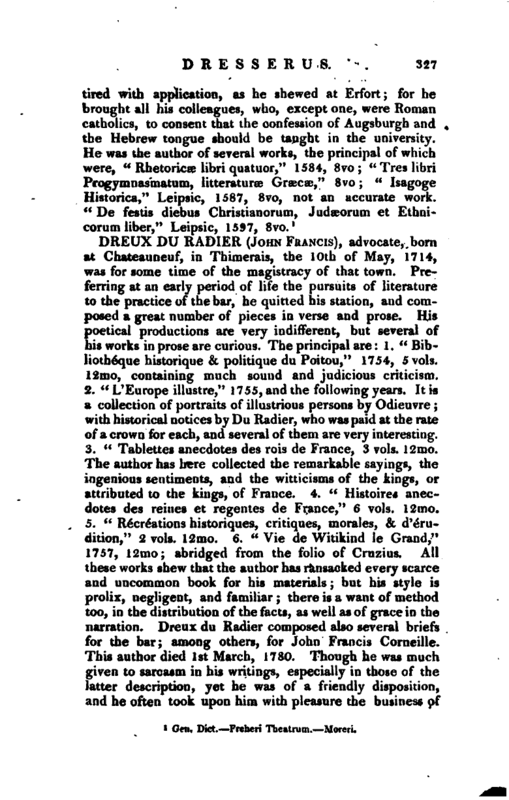 When he had taken the degree of M. A. in 1559, he read lectures in rhetoric at home; and afterwards taught polite literature and the Greek tongue, in the college of Erfort. 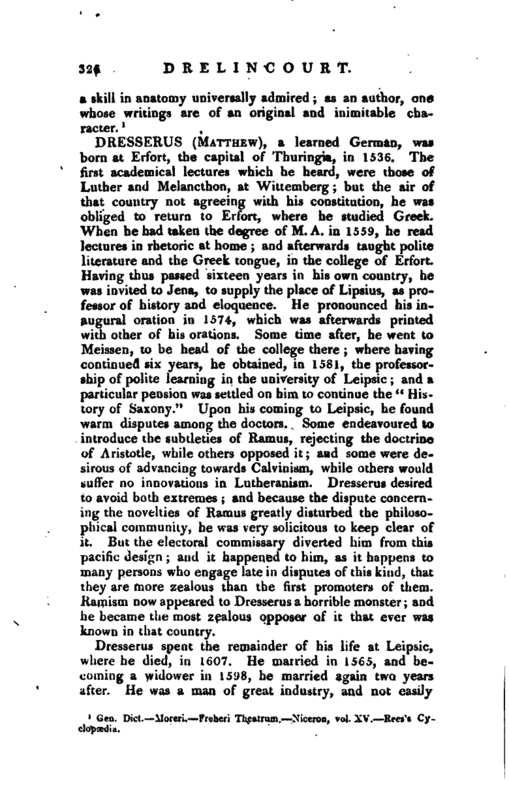 Having thus passed sixteen years in his own country, he was invited to Jena, to supply the place of Lipsius, as professor of history and eloquence. He pronounced his inaugural oration in 1574, which was afterwards printed with other of his orations. Some time after, he went to Meissen, to be head of the college there; where having continued six years, he obtained, in 1581, the professorship of polite learning in the university of Leipsic; and a particular pension was settled on him to continue the *' History of Saxony." Upon his coming to Leipsic, he found warm disputes among the doctors. Some endeavoured to introduce the subtleties of Ramus, rejecting the doctrine of Aristotle, while others opposed it; aad some were desirous of advancing towards Calvinism, while others would suffer no innovations in Lutheranism. Dresserus desired to avoid both extremes; and because the dispute concerning the novelties of Ramus greatly disturbed the philosophical community, he was very solicitous to keep clear of it. But the electoral commissary diverted him from this pacific design; and it happened to him, as it happens to many persons who engage late in disputes of this kind, that they are more zealous than the first promoters of them. Ilamism now appeared to Dresserus a horrible monster; and he became the most zealous opposer of it that ever was known in that country. Gen. Dict. Freheri Theatrum. —Moreri.